For all you Canadians out there. I'm not Canadian but I've always liked the flag and I did get to go to Vancouver for a day and everyone there was really nice. Here's to our neighbors to the north. Updated to include more red, comments welcome. i like it. a few suggestions though. if yuo had edited the user frame and button bmps it would have had a more together feeling. also, the blue background colour for teh user panels does not go well, i would suggest changing it to either red or whit to match teh rest of tehuser panel. and teh main backround should be set to "strecth" instead of "fixed size" so it works for all resolutions. aside from these things, i think it looks grweat. i await an update. I'll try to fix it but I'm still new at making logons right now. Thanx for the feedback. you're welcome. take your time, we all now that soemtimes time lts yuo do things, and other tomes it doeesnt. so whats up with this site the second logon that has the wrong picture 2 days after its been posted this 1 and the beijeig 2008 is some hacking the site or what!!!! I don't know what's up. 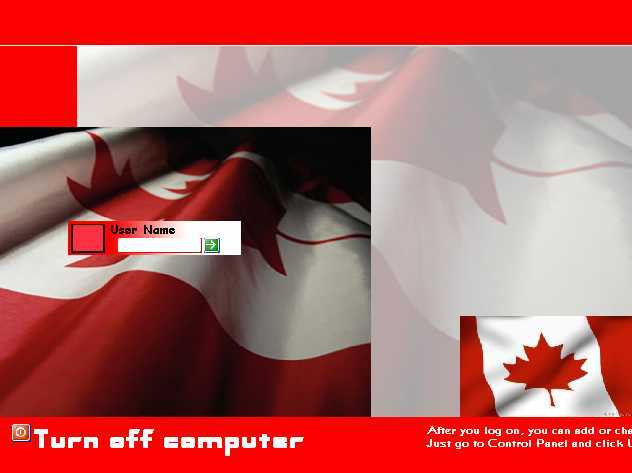 But the screenshot is from my 3rd logon how it got mixed up with the Canada one is a mystery to me. Thanks tons .. from Vancouver. -That font on the bottom looks awful. Maybe try something else. -The square edges on the other two flag pictures don't look very good, try blending. -And I don't know if it's just the preview pic, or if the real work is the same, but the jpeg artifacting is awful. Need more image quality. Other than that I think you got a good thing going here, keep it up. Thanks very much. Excellent job.